Altinex has added the TNP530 retractable tabletop interconnect box to its Tilt ‘N Plug family of products. 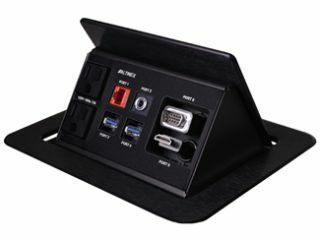 Designed for mounting into tables, podiums, or other furniture as part of a presentation system, the TNP530 offers power and connectivity options including dual 12-amp U.S. power receptacles, two USB ports, retractable VGA and HDMI video ports/cables, one RJ-45 network connector, and a 3.5mm audio connector. The TNP530 incorporates two of the company’s RT300 series retractable cable systems for both VGA (RT300-121) and HDMI (RT300-125) video connections. “The TNP530 addresses a number of commonly encountered situations in the contemporary meeting or presentation space," said Jack Gershfeld, president at Altinex. "Ready access to power means never having to worry about batteries becoming depleted before the meeting adjourns, the choice of VGA or HDMI connections that pull out of the unit make connections easier than ever, and the addition of network and audio connectors makes the TNP530 an extremely comprehensive solution for presenters.